The simple and prevalent view of obesity is that it results from bad choices in diet and exercise. However, that view omits the role of a major factor – stress. 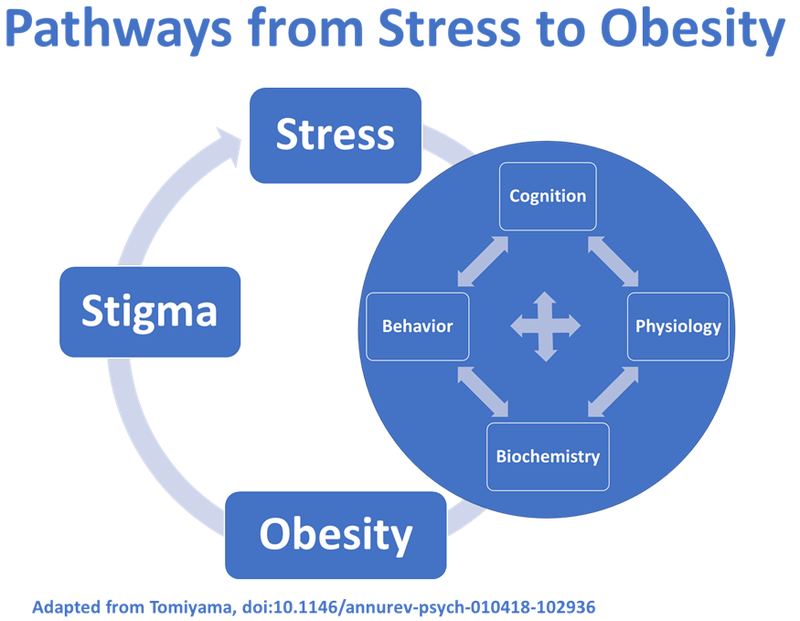 In the Annual Review of Psychology, Janet Tomiyama offers an excellent review of the vicious cycle of stress and obesity. The connection between stress and obesity takes many paths. Stress affects our capacity to think. Under stress, we make poorer decisions. We can’t regulate our own behaviors as well. Impulses turn into actions. But those actions reflect choices that are quite different from choices we make in a state of less stress. Stress also can have a more direct effect on behaviors that contribute to obesity. Under stress, we will eat more of foods that are high in calories, sugar, and fat. We might have difficulty sleeping or finding time for physical activity. And then, there are the physiologic effects of stress. Stress brings a response in HPA axis. That’s shorthand for the hypothalamus, pituitary, and adrenal glands. This is where the fight or flight response starts and it has profound metabolic effects. It has an effect on how your brain processes rewards. Finally, hormones that affect hunger fluctuate under stress. Levels of leptin, ghrelin, and neuropeptide Y can change and contribute to more hunger and fat storage. Through systematic blame and shame, our fat phobic culture magnifies the stress of obesity. Research shows that experiencing stigma and discrimination actually adds to stress. If you have any doubt about this, consider the daily humiliations – both large and small – that a person with obesity must endure. It becomes a stress inducing theme for everyday life. Tomiyama correctly points out that health policies to reduce obesity mostly ignore the role of stress. It’s all about diet and exercise. And yet, stress has a huge effect on patterns of diet and exercise. In addition, the hyper-focused attention to individual diet and exercise can have the effect of promoting blame, shame, stigma, and yet more stress. Thus, we may be adding to the problem with counter-productive strategies. It’s one more reason to demand good data on outcomes for well-intentioned obesity prevention strategies. Click here for the review by Tomiyama and here for further perspective from FiveThirtyEight. What’s so sad is when doctors, who people trust with their health and wellness, are unempathetic, uninformed, and indifferent toward getting the holistic care and treatments for their patients with obesity. In my opinion, this is a gross violation of the Hippocratic oath. The stress one experiences when your own doctor(s) dismiss your need for attention and treatment of obesity is truly debilitating. 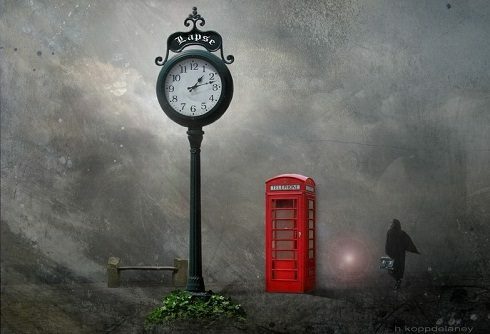 Thankfully, things are changing, but surprisingly, not fast enough and with considerable continued backward-thinking haggling. I find this information very interesting, Ted. It’s so important to address the whole person, not just the manifestation of symptoms associated with obesity. I’d like to know how many ‘corporate wellness’ programs that focus on weight reduction to control healthcare costs include stress management and acknowledgment of stress as a contributing factor to healthcare costs>associated with higher rate of other conditions/concurrent with other contditions>contributing to overweight or obesity. Really good discussion. I find that smart employers are focusing on the broader concept of total well-being now and steering clear of the narrower concept of wellness that got so much bad press over the last many years. The semantics don’t matter so much. But as you point out so well, Susan, considering the whole person really does.